Within a half an hour of leaving Salt Lake City, you can be driving along a beautiful and scenic mountain road with gorgeous views in every direction. That is one of my favorite things about Utah…it’s not hard to get away from it all and have an awesome experience outdoors. 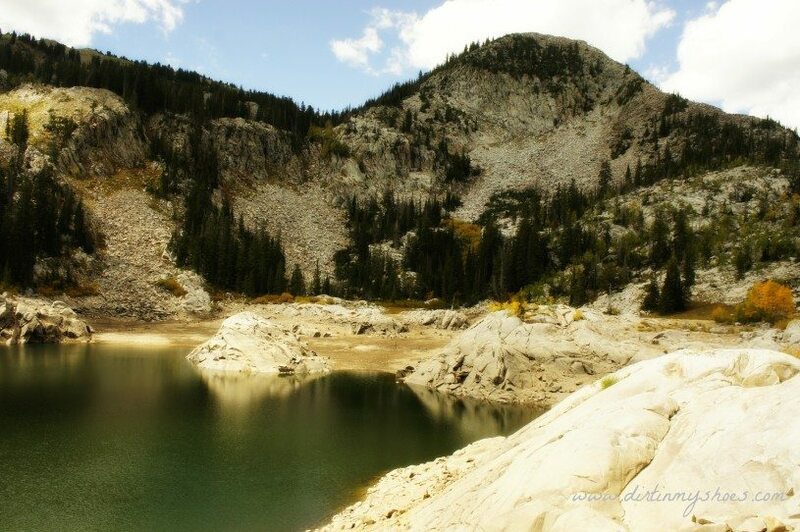 At the top of Big Cottonwood Canyon (famous for its ski resorts) is the Brighton Lakes Trail. This hike takes you to four picturesque lakes resting peacefully at the base of the mountain peaks. More often than not, moose are spotted in the area munching on the ferns along a shoreline. I always like to find a rock to perch on to enjoy my picnic lunch, allowing me to soak in the views for just a little bit longer. Which of the Brighton Lakes will be your favorite – Dog Lake, Lake Mary, Lake Martha, or Lake Catherine?! This area is in the heart of the Salt Lake Watershed, meaning there is no swimming allowed in the lakes and no dogs allowed on the trail. Because of the watershed, I suggest hiking this trail early in the summer as soon as the snow melts…usually mid to late June. We were up there in September, and although the fall colors were stunning, the water levels in the lakes were so low they looked more like little rain puddles. Which brings me to my next point. If you’ve read my Big Springs Hollow post, you know that I really don’t like seeing man-made structures along the trail while I hike. I openly admit to being a little bit of a trail snob! These are not naturally occurring alpine lakes. They are reservoirs with big, ugly cement dams. Along those lines, you will also be hiking next to the ski lifts for a good portion of the trail. I mention this only because it bothered me and detracted from my wilderness experience. If you are like me, this may not be the best trail for you (or at least you can go into it having a better idea of what you will see). That being said, the hike is quite lovely and the Brighton Lakes are gorgeous. The first lake you will come to, Dog Lake, is at the end of a short side trail. Dog Lake is prime moose habitat. The next lake, Lake Mary, is the largest of the four and sits at the base of a beautiful mountain peak. Lake Martha is quite small but pretty. Lake Catherine is the furthest along the trail and the most dramatic, sitting in a bowl with peaks surrounding it! This trail is 4 miles round trip (slightly longer if you take the short spur trail to Dog Lake). It is uphill most of the way, with little to no tree cover for the first mile because the trail takes you up the ski hill. Be sure to pack sunscreen and water! From Salt Lake City, take I-215 east and exit at 6200 South toward the ski resorts, exit 6 (don’t use the Exit Only lane). Take a right onto Wasatch Boulevard and travel south until you reach Fort Union Boulevard (7200 South). You will see signs for the Brighton and Solitude Ski Resorts, as well as Big Cottonwood Canyon. Turn left and head up the canyon until you get to the Brighton Ski Resort at the very top (about 14 miles). The Brighton Lakes Trail starts next to the Main Lodge, beneath the Majestic and Crest Express chairlifts. Look for the large wooden sign marking the start of the trail. Have you hiked this trail? Tell me which lake is your favorite in the comments below! Love this hike! Especially when you make it to Lake Catherine. I agree with you – it’s better done earlier in the hiking season than later. Have you hike Sunset Peak? It’s cool to see the view of all the lakes from there.